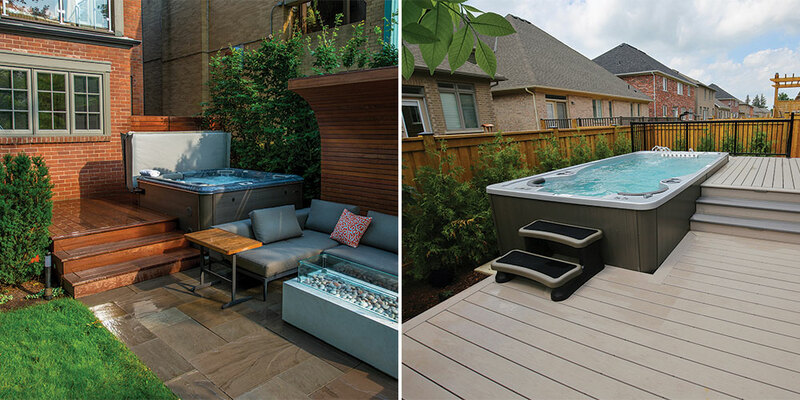 For some hot tub and swim spa buyers, figuring out exactly how to fit their new hot tub into a new or existing backyard design can be tricky. With that in mind, today we will give our best tips for landscaping around a hot tub or swim spa. Even before you purchase your new hot tub or swim spa you should know where it will be placed in your backyard. If you plan on using your hot tub or swim spa in the late fall and winter, we recommend placing it as close to a door as you can. The shorter you can make that cold winter run to your hot tub, the better! You should also try to avoid placing it right in the middle of your yard. While it might look nice, placing a hot tub or a swim spa in the middle of your yard is often not a great use of space. By placing your new hot tub or swim spa to one side of the yard, you open up a greater area on the other side for other activities. Another thing to consider in your backyard design is privacy. When you’re relaxing in your new hot tub the last thing you want to see is a nosy neighbour staring at you from across the yard. From simply orienting your hot tub cover to block your neighbour’s sight-lines to installing a privacy screen to building a privacy wall, there are many options available to ensure maintain your privacy. Depending on your design, you can use anything from wooden or stone walls, scrubs, trees or simply your cover to improve privacy around your hot tub or swim spa. Our next swim spa and hot tub landscaping tip is to establish a focal point in the overall design. While this will often be the hot tub or swim spa itself, that doesn’t always have to be the case. Among other things fire pits, fountains, gardens and pergolas also make for great focal points in a backyard landscape design. No matter what your focal point is, make sure that it stands out above the other elements in the design. Highlight your focal point with other elements such as lighting or plants and make sure that it is not competing for attention with other elements of the design. To ensure your entire landscape design looks cohesive, it is important to use materials from other areas of the design around your hot tub or swim spa as well. For example, if you’ve built a stone patio next to a swim spa, then place the swim spa on a simple poured concrete slab, the design no longer looks cohesive and the swim spa can seem like it was just placed there with no real thought. To fix this, without the added cost of laying all that extra stone, simply put the concrete foundation around 6″ smaller than the swim spa itself, then bring your stone right up to the edge of the concrete pad. When you put the swim spa in place, the concrete pad will be hidden and it will look as though the stone is carried through the entire design. Using the same materials in different elements of your design is the best way to ensure that the whole design looks cohesive. One of the biggest decisions that most people make when buying a hot tub or swim spa is what colour of acrylic to choose for the interior. Few people, however, put the same consideration into what colour the cabinet should be. This is a mistake. 90% of the time the acrylic shell is hidden under the cover, while the cabinet is always visible. From a landscaping perspective, the colour of the cabinet is, therefore, more important than the colour of the acrylic shell. Try to pick a cabinet colour that works well with the rest of the design. If you have a brown brick house with a stained wood deck, a brown cabinet will blend in and look cohesive with the rest of your backyard, where a grey cabinet will just look out of place. Another effective way to get a more cohesive backyard design is with shape. Mimicking the square shape of your hot tub in other elements – such as a deck or flower beds – is a great way to make all of the elements in the design look as though they belong together. 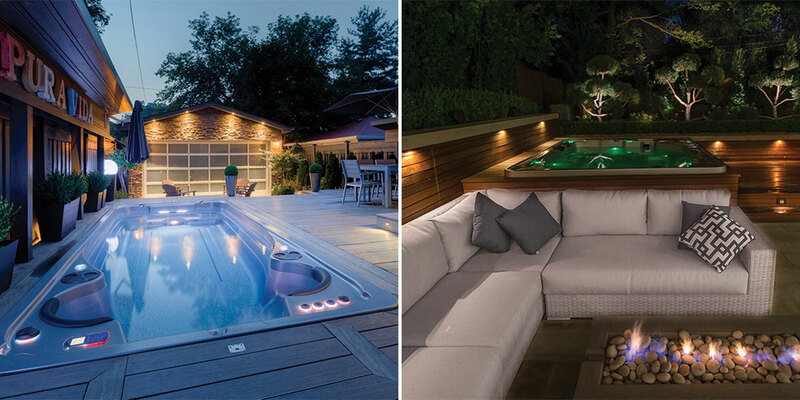 Lighting is both a great way to add a “wow factor” to your design and a practical way to make using your hot tub or swim spa at night easier, safer and more enjoyable. 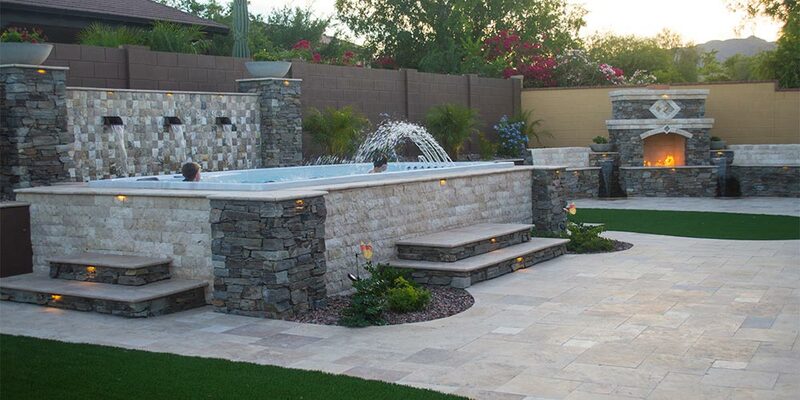 One of the biggest and most basic challenges of landscaping around a hot tub or swim spa is how to make what is essentially a large box blend in with the rest of the backyard. One common fix is to simply install the pool or hot tub in-ground. While this can look great, it is also fairly expensive. Not only do you have to build a concrete “bunker” to house the hot tub or swim spa, you also have to incorporate a drainage system into the design to prevent groundwater buildup. Fortunately, you can achieve a similar – if not better – look by instead using a multi-level design approach. Rather than sinking your swim spa in the ground, build a deck up around it, leaving around 1/2 exposed. Rather than just leaving your hot tub sitting on a concrete slab in the middle of your yard, put it near your flower beds then build up some stone walls around it and install some raised flower beds for a 2 tier garden look. 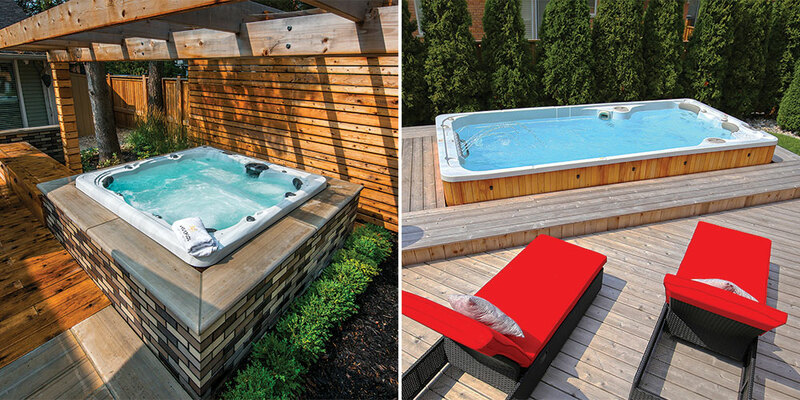 Utilizing a multi-level deck design is a great way to break up the “boxy” look of most hot tubs and swim spas. Our last hot tub and swim spa landscaping tip is also the most crucial. When coming up with your backyard design, always keep in mind that your hot tub or swim spa will eventually need to be serviced. Make sure that when it does, your entire design doesn’t need to be torn apart just so the technicians can properly fix the issue. 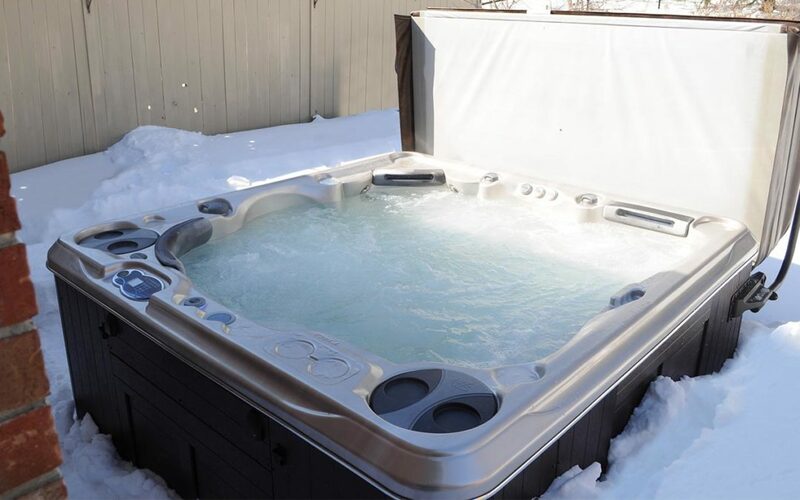 All hot tubs and swim spas have access panels – typically under the main control unit – where all of their main components (pumps, heaters, sensors, etc) are housed. Don’t block this panel, or if you do make sure that it can be unblocked easily. If you’re sinking a hot tub into a deck, make sure that you install a “trap door” or removable section in front of the access panel. If you’re installing a set of stairs that leads up to your swim spa, make sure it can be easily lifted and moved out of the way when needed. A little bit of thought and planning in the design stage can save you a ton of headache, and expense, in the future. There’s nothing quite as frustrating as having to completely rip apart your expensive landscaping just to replace a $2 rubber gasket.